Watch a live stream of this event beginning at 7 p.m. 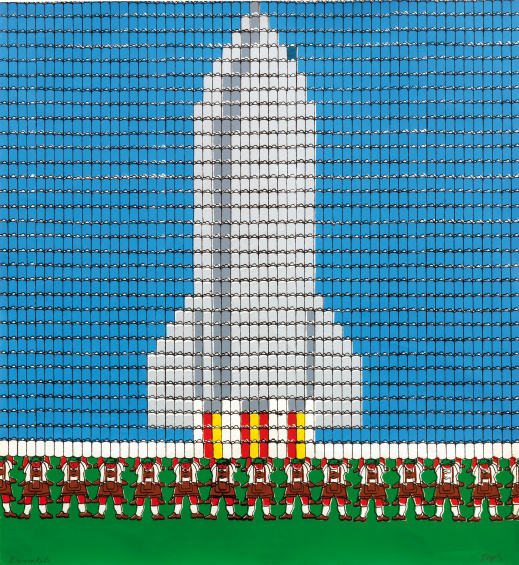 Bringing together a new generation of artists interested in Thomas Bayrle’s legacy, this panel will look at how younger voices take up questions around corporate production, political spectacle, digital technology, and urban planning in their own work. The conversation will be moderated by art historian and critic Alex Kitnick, and will feature panelists Lena Henke, Jacolby Satterwhite, and Jordan Wolfson. The panel is organized on the occasion of “Thomas Bayrle: Playtime,” the first major New York museum survey of Thomas Bayrle (b. 1937, Berlin, Germany). Bayrle is one of the most important artists to have emerged during the West German economic boom in the 1960s, and has received belated recognition for his influential works and processes. Long before the advent of current visual technologies, he foresaw our digital reality, employing photocopy machines and other midcentury tools in his early works to create analog visualizations of what we now understand as digital culture. Bayrle’s thematic investigations have ranged from a visual analysis of mass culture and consumerism to reflections on how technology impacts global politics. This comprehensive survey will bring together over 115 works, including paintings, sculptures, drawings, wallpapers and prints, early computer-based art, videos, and films.